Your Doctor's Wife: A Passion for... Dentistry? Today, I'm coming clean. I've been lagging around here and let me tell you why. I've been cheating on you with my dentist. And, unfortunately, it has not been pleasurable. For the past two weeks, I've either been in the chair with my dentist, or thinking of him every second of the waking day.... cursing him out, as I wallowed in the pain he inflicted on me. I've been needled, injected, drugged, numbed, drilled, impressioned, poked, scraped, bite-blocked, drilled, drilled, drilled, and drilled some more among other unmentionables. I've even been crowned. And in the midst of my dentist administering such pain, and he knew he was killing me (my legs involuntarily kicking up out of the chair were a clear signal of my shooting pain), I just couldn't understand how someone could get turned on by the field of dentistry. There's no reward in dentistry, is there? People come in for cleaning. If all goes well, they leave with clean teeth, a travel sized tube of toothpaste, a small pack of dental floss, a new toothbrush, and if they are lucky, no bleeding gums. Otherwise, we're leaving numb after having being tortured, well aware of the pain that is to come once the lidocaine wears off. Dental patients are not happy coming or going. So, where's the reward in dentistry? Dentists aren't privy to the gratefulness of patients after appointments. At least Orthodontists are able to share in the excitement of their patients when their orthodontia is finally removed and their beautiful teeth are revealed. But, basic dentistry? Nada. Nothing. Why does one choose dentistry? 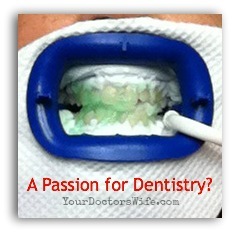 How does one develop a passion for dentistry? I am perplexed. Confused. Can't understand it. Obviously, I'm missing something. Can anyone out there explain it to me? Perhaps the appeal lies in the short training time compared to medical school and very good pay once you're done? In South Africa the training is only one year less, but they don't have to do the two year internship medical graduates have to do, so in effect more like three years less. Then also the salary is excellent in South Africa for dentists, and their hours are a lot more manageable. I know a lot of girls who wanted to study med, but then decided that dentistry would be a more family-friendly option for their futures. And then... I guess some people just like the field. I love ophthalmology, for example, and some of my friends don't understand why I enjoy shining bright lights into eyes all day. To each his own, I suppose. Dentistry definitely wouldn't float my boat, though. In all honesty, it's probably one of those thankless careers that you know you're doing good, even though no one wants to see you. Oral problems lead to problems in the rest of the body, so I'd say they like knowing they're saving patients from WORSE pain down the road. That's how my mom (dental hygienist) sees it. I agree with Chrissie. Nice hours, no holidays or weekends, no emergencies, good pay... it sounds tempting. But even for all of that, I couldn't look in people's mouths all day. Agree with the above! It's such an easier path but still a medical field that pays well so most would consider it a win. But you're right...how does one go into work everyday saying "I can't wait to brush someone's molars today." That is still a mystery to me too especially when everyone and their mother that we know hates going to the dentist because its usually an unpleasant experience. Although I did like the treasure chest I got to sift through after my appt on my way out when I was 10 yrs old. I always wonder why one chooses to be a dentist, someone who instills fear in all patients. Good thing my dentist is young and hot! I know some Calgary dentists who very much enjoy their job. There's no accounting for taste.